One of the most beautiful treasures in our World of Teas. 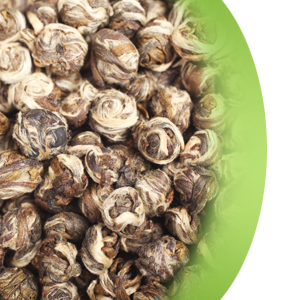 This precious jasmine tea grows in the mountains of Southeastern China. A highly fragrant specialty tea, traditionally rolled by hand for centuries. The jasmine pearls fascinate by an incomparable sweetness with a most delicate jasmine flavor. Recommended multiple steeps with average times well below 3 minutes each.